Tightening the turn signal lever and doing an inspection of the switch on a ’66 Nova is one procedure that most of you with this model Deuce have done at least once (or at least need to do). Our test mule to show you what’s involved is a 17,000-mile original ’66 L-79 car. Over the last 6 months or so, the turn signal lever has become loose, which makes it a hindrance to use before every lane change or turn. One thing that I’ve wished for is that it could be tightened without pulling the steering wheel since it’s never been off, but things are never that easy. Prior to starting the procedure, make sure the battery is disconnected. The first step is to pull the center cap off of the horn ring bezel to expose the steering wheel retaining nut and the plastic three-hole insulator. Remove the three Phillips-head screws that hold the insulator to the steering wheel hub. This will allow the horn ring and the insulator to come off. Next, remove the steering wheel retaining nut (3/4-inch socket and a ratchet will do fine). Mark the steering shaft and steering wheel so that the wheel is put back on in the same position. A center punch works well, but a magic marker can also do the trick. Before installing the steering wheel puller, make sure all threads on the puller and in the wheel are good with no burrs, cross threads, or dirt. If this is not done, damage can occur to your puller and/or the steering wheel threads. Generally speaking, it is best to leave the steering wheel retaining nut on and place it at the end of the shaft to protect the threads while using the puller. After the puller is installed, put pressure on it and see if the wheel wants to move on its own. If not, a little encouragement with a small hammer on top of the puller shaft may be needed. When pressure on the wheel releases you can then remove the puller and the nut so the steering wheel can be removed. Once removed, it will reveal part of the cancel cam mechanism with the copper contact plate attached and the spring in place. Remove both of these items to expose the turn signal switch. We tightened the turn signal arm to correct our specific problem. Amazingly it took a little bit of work just to tighten the screw! If not done though it could have damaged the switch and or the screw could have come out and gotten lost inside the column! We Have the Part For You! In our case, we were not going to remove the switch. If your car needs a new switch, verify you have the correct replacement part before removing the defective one. 1966 was an odd year as two different styles of switches were used. It’s a 50/50 chance that you will order the correct one without first inspecting your car. It is best to know which one was used before ordering a replacement. 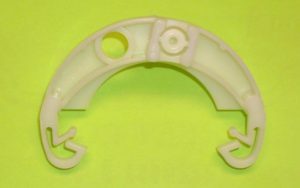 One design is plastic on top with a pot metal/die cast lower section (38004). The other model is all plastic (38005). Both switches include the built-in bearing and spring-loaded plunger. Other things to look for that may be worn out while you have the steering wheel off is the cancel cam on the back of the wheel hub, which looks like a small cup (38025). If you have the switch 38005, the C-shaped cancel cam on top of the switch is available by itself (38024). If only this part is defective it can be replaced, if the switch has lots of age and wear it is best to replace the whole switch, though. If the C-shaped cam broke and it is the same age as the rest of the switch failure will soon follow. After years of use, the plastic will become brittle. Removing the switch is fairly simple. Remove the attaching screws and route the wires up through the column, reverse this procedure to reinstall the new switch. If you are working on a project like this, or something else for your Nova. Shop GM Classics today!